The puppies are here! Tamerlein had 7 puppies, all boys! Please see below for comments and pictures. Our final week has begun. These have been such sweethearts. It is going to be so sad to say goodbye but I know that it will be incredibly exciting for everyone as their puppy enters their lives. In the end, I ended up with several cuddlers (Pluto, Daffy, Thumper, Baloo, Goofy). All of the puppies enjoyed being held. Donald and Mickey were the most playful. The coats on these puppies are very thick (Daffy is the only one with a shorter coat) and most look like they will be wavy like their father. All of the health checks were good and they have continued to grow really well. Pluto is the biggest puppy that I have ever had and the smallest puppy here would be large in any of my other litters. These are 7 week and 1 day weights which is very early for their last weigh in. Taking pictures has become harder and harder as they are very active now. That said, they are so beautiful that it is fun to get their pictures. Adopted by Ron & Carrie K.
Adopted by Arlan & Karla C.
Adopted by Jennifer & Wade K.
Adopted by Carl & Kelly I. Adopted by Juston & Lauren W.
The adoptions are complete. All the puppies have new homes now. It was amazing and wonderful to watch everyone interact with the puppies. They have developed so much personality in the past few days. The weights posted below are from Sunday morning so they are 4 1/2 days of growth. As you can see, they are continuing to grow really well even though they are down to 1 nursing per day. Baloo loves to cuddle but also loves playing. He has a very balanced personality. Daffy is a sweetheart but he also loves to explore. He seems to have shorter fur than the others. Donald is the most energetic puppy and for now, the most vocal. He is very fun! Goofy is a relaxed puppy, though you will find him playing like the rest. Mickey has an all-round personality. He is energetic and still loves to be held. Pluto is big and relaxed. He is very calm and has a sweet personality. Thumper is affectionate yet energetic. He loves to snuggle but then will be off to play with his brothers. Click above for the link to the temperament test. On my other litters I have waited until week 6 to run this test but I was able to get fairly consistent results from them already. The only difference I faced in running them early is that I had to run a couple of puppies in a group setting for the retrieving test because they are not yet conditioned to being alone (that takes training too!). 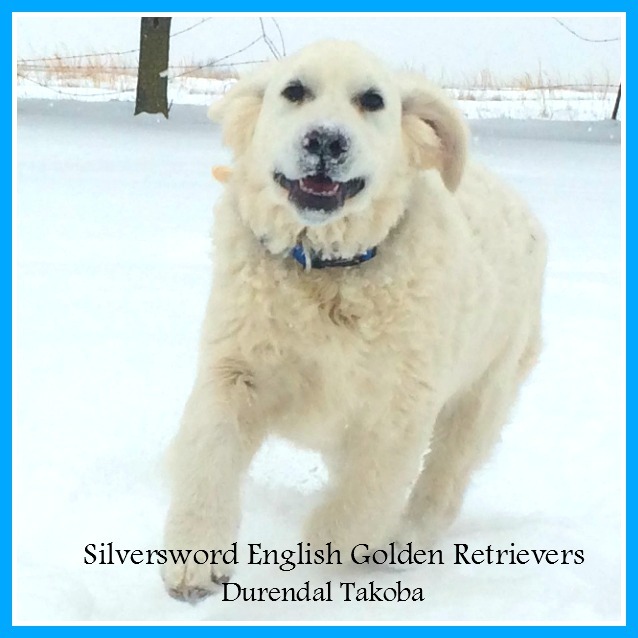 Once again, the puppies are very consistent and responded as golden retrievers should (see my extra comments that I have built into the test from all my other puppies to identify the unique golden retriever responses). The puppies personalities have emerged! After being relaxed until now they have finally begun to run around and play. They continue to look beautiful and very mature. It is going to be very hard to choose between these guys since they are so similar. I have begun their personality testing and as you would expect, their results are quite similar. There are a few early differences in 2 or 3 categories. I will post the results on Wednesday, once I am finished with all of the testing. Here are their weights. Their growth has slowed to more normal amounts now that they only nurse 2 or 3 times per day. Mickey adopted by Carl & Kelly I. The puppies are so laid back. I was talking to my son about it and I think that it is because they had so much food (mother's milk was very rich) that they were never in competition for anything. They are always content and relaxed. Again, they are bigger and more advanced than any other puppies that I have had. They are also the most even litter (they all look very similar and the one that looked different before--Pluto--now looks alike) both in looks and temperament. I will be working through the temperament testing this week and will try to post the results on Wednesday. I have provided brief comments on each puppy below. Puppy weight changes are from last week. For reference, I have had many puppies leave at 8 or 9 pounds (at 8 weeks). Baloo is the most friendly and most active puppy of this group (which would make him one of the most relaxed puppies in any other litter). He is sweet and he was my son's favorite until this week. Daffy is very even in all characteristics (well-balanced). He is often quick to come for petting and cuddling. Donald is one of the more explorative and playful of this group. He has a very cute face and his eyes will melt you. Goofy is very smart. He is quite relaxed and laid back in personality. He has a beautiful coat. Mickey is playful but as all the rest, still very relaxed. He has a nice square, blocky face. He enjoys petting but also likes to explore. Pluto had been our thinnest faced puppy but he has completely caught up. He loves to play and sit in our laps. Thumper is now my son's favorite. He is very cute (my son thinks he's the cutest but I think a couple others are my favorites). He is very relaxed and loves to sit with us or other puppies. The puppies are big and beautiful. My picture quality is a little lower than I hoped for because I was trying out a new, low-light camera. It was better than my other would have been but not good enough for what I hope to post. That said, the puppies are incredibly cute--they love playing and sleeping in mounds. They are getting their personalities and I will be able to give individual comments on my Friday post (hopefully with better pictures too). Most of these puppies are very relaxed and all of them enjoyed their first bath today. I will post their weights tomorrow. The first full set of pictures is up. You will notice that they are really similar looking and incredibly cute. They are just developing their personalities. Most of them are relaxed. This is especially true after nursing. They are eating solid food but still love to nurse and their mother loves it too. I have been mentioning that they seem to be very even sized and large--for comparison I looked back at Daisy's last litter. When Daisy's puppies left, they were very good sized puppies. At 4 weeks 2 days (actually 2 days older than these puppies are today) they ranged in weight from 4 pounds 1 ounce to 5 pounds 5 ounces. Yes, Daisy's biggest puppy was smaller than the smallest puppy from Tamerlein. Fat, content puppies! 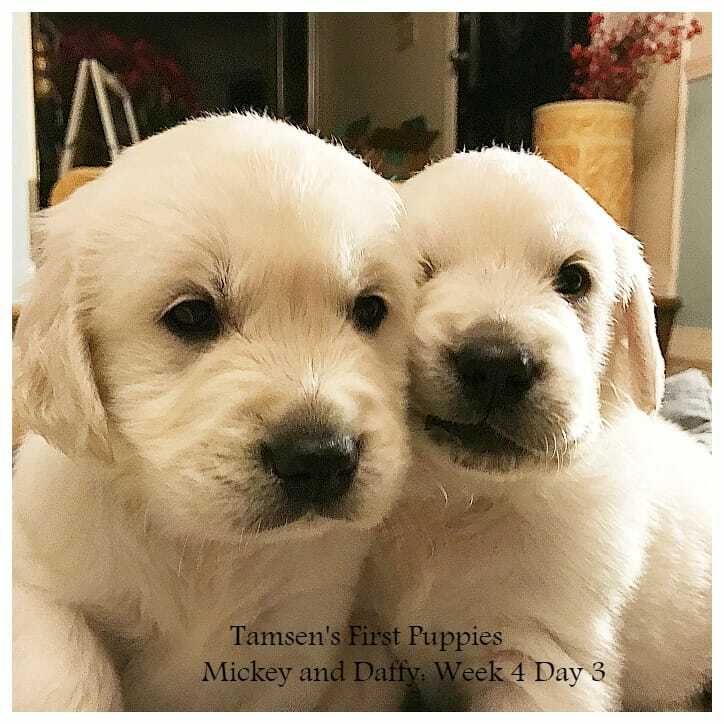 Here are the week 4 weights for Tamerlein's puppies. The puppies are big and cute! We have named them Donald, Goofy, Thumper, Baloo, Pluto, Daffy, and Mickey. There are two pictures each of these puppies (in a row if you can identify a starting pair). They are a little easier to tell apart now but they are still very similar in build and personality. They all look to be good sized and have nice faces and coats. Starting with our Friday post, we will have their name tags on and you will get to see each puppy individually. The puppies are now beginning to eat solid food. It is still just nibbling for them but by the end of this week they will transition to getting more nutrition from their solid food than from their mother. They continue to be very large and very even. All of them are cute, large, and friendly. The pictures today are of each puppy. You will notice that without name tags it is almost impossible to tell them apart. I have names for them so they will be get their name tags by the end of next week (when they are big enough to keep them until 8 weeks) and you will be seeing their individual pictures after that. We woke the puppies up for these pictures so they were pretty relaxed (with one yawning picture because I couldn't resist). The puppies are beginning to walk around more. They are a very consistent group. As of right now, five have the larger, broad heads and are looking to be bigger. The other two are also quite large and would probably be large for any other litter but they are smaller for this group. They are also continuing to learn and become more and more relaxed in the various positions for neurological stimulation. There are still 3 that are much more relaxed during the odd positions and I expect them to continue to be more laid back. All of them are friendly and already like to be held. There eyes are completely open and they are moving around a lot more because of this. The pictures are from yesterday, but my internet has been down (I am at a friend's place tonight). Hope you enjoy! Once again, the puppies are continuing to grow very quickly and are looking beautiful. They are still in neurological stimulation and most have completely caught on to what is going on and are very comfortable with all of the positions that they are put in. It is really neat to see them relax in such odd positions but they already trust me and respond to my voice (I whisper to them and then will relax like they are being loved). 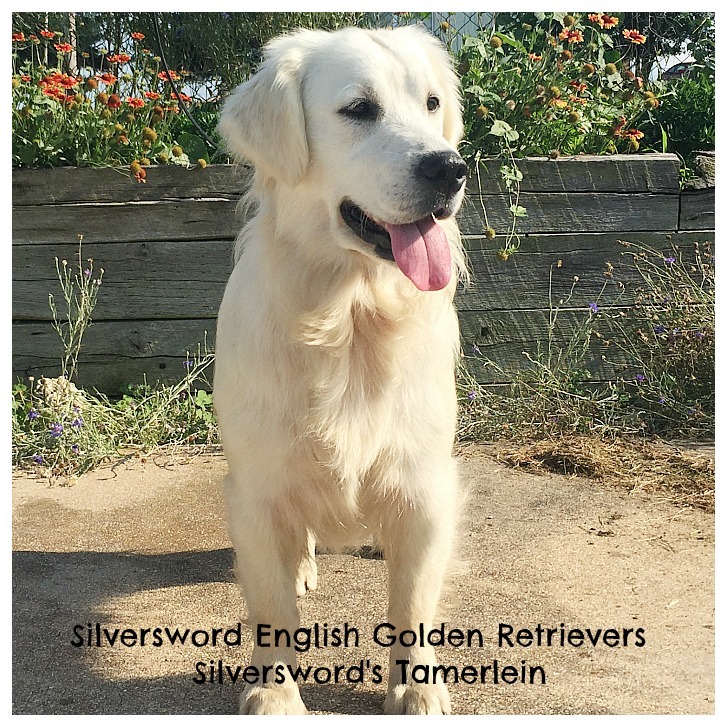 Tamerlein is doing great as well. She is a very content mother. The puppies continue to impress me with how quickly they are developing. They normally open their eyes around day 12 but I got to see little glimpses of their eyes today. They continue to be very large and they are also a very even litter--the difference between the largest and smallest puppy is not very much. They are halfway through their neurological stimulation and are learning very well. And Tamsen is still incredibly at mothering. She does everything that I want her to naturally--this litter has been a total pleasure because of her. The puppies are already one week old! They are very plump and move around well when they are awake. They are a very content group so they sleep a lot (that is a good thing). I can already observe (during the neurological stimulation) that there are going to be almost a complete split of active and relaxed puppies here--if they continue to develop as they are showing now. Tamerlein is a very content and happy mommy too. These puppies are maturing very quickly! They are huge. I removed their dewclaws today and am continuing with their neurological stimulation. They are moving around a lot already--though they don't walk--they just scoot around. They are a really fun group to watch and their mother makes them a total joy! The puppies are 3 days old now and already they are changing from pink skin to black. I began neurological stimulation today. I love it because I get to see the puppies learn and also demonstrate just a little of their natural tendencies. This is Tamerlein's first litter and she truly takes after her mother (Orcrist), my best mother. She is brilliant and makes my life so easy. The puppies are always where they are supposed to be and she is feeding them like an older mother. My wife saw three puppies all laying away from their mother and was concerned--it turned out that they were all milk drunk (like after Thanksgiving dinner). I plan on posting pictures of the puppies tomorrow. Tamsen started having puppies around noon and she has been very quick so far. She has four puppies as of 1:44. Five puppies as of 2:08 Six as of 2:40. She had number 7 at 4:00. That was her last puppy. She is doing fantastic and takes after her mother--she is very smart as a mother. Last night, I checked on her every 1/2 hour and had nothing to do--she was already lining all her puppies up and getting them to nurse. I will try to post some pictures of her later today. I am also finishing up with Daisy's puppies so it is a very busy time! The puppies are nice and plump and all are eating well. Tamsen (Tamerlein) is doing a spectacular job with them.